At 23, Taylor is one of the brightest stars to recently come out of the St. Thomas YC. He has recently graduated from Boston College and had led their sailing team to many collegiate championships. Taylor has devoted his life to match racing. As the current sailing director at Chicago Match Race Center and ranked 15th in the open ISAF rankings, he has made a presence on the WMRT circuit while finishing 6th at the 2010 Gold Cup, 4th at the 2012 Chicago Match Cup, and other Grade 1 events where he finished 5th at the 2011 Chicago Match Cup and 3rd at the 2012 Congressional Cup. Taylor looks to continue climbing the rankings and put in a bid for the 2013 WMRT. Peter is from Chicago, IL, currently attending Hobart and William Smith Colleges in upstate New York. He has been sailing since he was about 6 years old. He started sailing at Chicago Yacht Club, but has recently been training out of the Chicago Match Race Center as well as Hobart and William Smith Colleges’ Sailing Team. Growing up, he sailed lasers, 420s, and many keelboats in Chicago. He has been competitively match racing for the past 4 years. Some of the events he has been successful include the Governors Cup and Chicago Match Race Center Grade 2 both as a trimmer/tactician, while having additional success at the Oakcliff Summer Clinigatta placing third. Vladimir currently lives in Moscow. The Russian’s teammates are Nikolai Kornev on the bow; Egor Larinov, trimmer; Alexander Ekimov, main trimmer and Russian-born Port Washington resident, Leo Vasiliev, pit/trimmer. Lipavsky and the Moscow Match Race Team recently finished 2nd at the Sails of the White Nights in St. Petersburg in June. Prior to their June “home” regatta, they sailed two events in Hong Kong, placing 1st in the Visitors Cup and 2nd in the BNP Paribas RHKYC Match Race. Freshie Racing Team was formed in early 2010 as a campaign syndicate based at the Royal Freshwater Bay Yacht Club, in Western Australia, with the sole aim to reach the highest level of world match racing. Formed by skipper Peter Nicholas, the team includes a core crew of Jay Halligan, David Castles and Jake Flintoff. Since 2010, the team has competed successfully both locally and internationally, with a European tour in 2010 and again in 2011, winning a number of events along the way. Riptide Racing is a young match racing team from the United States that is new to the game but eager to prove they have what it takes to compete with the best. Lead by skipper Chris Poole of Maine the team aims to be on the 2014 World Match Race Tour and help promote the growth of match racing in the United States. Mike Quaglio started helming keelboats at age 11, and has won many fleet racing and distance racing events over the past 25 years. Mike founded Team Q Match Racing in 2010, and trains at Oakcliff Sailing Center. Jordan Reece and his Estate Master Sailing Team powered by Etihad Airways will compete in Oakcliff for the first time at this year’s Oakcliff International. Representing the Royal Sydney Yacht Squadron, Estate Master Sailing Team will be the youngest team competing in the event with an average age of 21 and will be the team’s fourth event on the US Grand Slam Series. After competing on the youth match racing circuit within Australia & New Zealand, Estate Master Sailing Team traveled around the world in 2011 in an attempt to climb the ISAF Match Racing World Rankings. A campaign that in the end paid off with Estate Master climbing from 119th to now be ranked 16th in the world after wins on the Polish Match Racing Tour, Jagna Eliza Trophy and Detroit Cup Grade 2. Since teaming up in 2010 Estate Master Sailing Team has continued to improve each year. In 2011 they competed in 15 events, made semi-finals in 10, the finals in six and won three – results which convinced software property company Estate Master to come in as title sponsor and Arabian airline giant Etihad Airways as the Official Airline for the team. In 2012 the team has again performed well having competed in nine events, making the semi finals in six events & finals in four which included a second place finish in the Alpari World Match Racing Tour Chicago Match Cup event in July with Reece becoming the youngest skipper to compete in a final as well as the first qualifying team to ever make a finals of a World Tour event. With a goal of gaining a World Tour card for next year the team will be looking for a strong finish here in Oakcliff this week. Estate Master Sailing Team is sponsored by Estate Master Property Software, Etihad Airways – The National Airline of the UAE, Hill PDA & Gill Australia. Kristof Rosinski, founder of Open Yachting, currently at his best ISAF Match Racing World Ranking 25th. As an Organizer of twelve ISAF graded events and more than twenty other Sailing events in 2011 Kristof has been focused this season on Match Racing and further developing. As early as on February he organized Match Racing Clinic. The goal for this season is further advance in ISAF World Match Racing Ranking, getting good results in G2 events in Oackliff USA, Pornichet France and winning of all Grade 3 events he’s participating this year. That’s only third year Rosinski Open Yachting takes really part in Match Racing events! Magnus has experience in skippering dinghies, keelboats, high performance catamarans, International 14 Foot Skiffs, up to the Tall Ships found in the Antigua Classic Yacht Regatta. His experience extends beyond regatta competition and championships in countries around the world to include sailing across the Atlantic Ocean. He was the Swedish national champion 5 years in a row in the largest 2 person dinghy fleet in Scandinavia (Scandinavian type 470 dinghy) and Swedish national champion in sprint (similar to match racing but with heats of 6 boats). 12th in J80 World championship and 3rd place in Eurocard Round Gotland Race (one of the world’s largest offshore races with 300+ participating boats), skippering a Beneteau First 36.7. Magnus now lives in Canada and has been active in high performance catamarans and match racing, currently starting up a match racing club at the National Yacht Club in Toronto. Nicolai and his crew are a group of young Danish sailors, who have been sailing together for a couple of years. In 2010 they started sailing more international events together trying to climb up the ISAF world rankings. Besides their sailing, they are all studying at different universities in Copenhagen, Denmark. Full Metal Jacket Racing is a young yacht racing team looking to make an impact on the sailing world. The team consists of William Tiller, skipper; Brad Farrand, main; Harry Thurston, trimmer; Jono Spurdle, pitman and Shaun Mason, bow. Will was one of 10 selected for the Royal New Zealand Yacht Squadron Lion Foundation Yoth Training Programme. 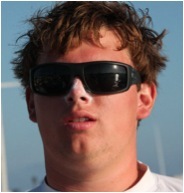 He then formed Full Metal Jacket Racing and has taken his Open ISAF match race ranking from 70th to 10th in the world. They are the youngest team inside the top 20 and performed very well at the 2011 Monsoon Cup, the biggest event on the World Match Racing Circuit. By reaching an ISAF ranking of 14 in June 2012, they have accomplished one of their stated goals.